The paradigm of preservation of cultural heritage has significantly shifted in the last decade. It has moved from the conventional preservation of static material relics in order to embrace the living realm around historic buildings, sites, cities and landscapes. Thus, a more holistic approach that seeks to boost the sustainability of heritage, as a human and community capital, is required. Here, sustainability not only means the physical side of a monument that reflects the image of a site, but the site itself is questioned as a living landscape in order to find triggers for the reactivation of the synergies of historic urban settlements. Accordingly, the North African context is an insightful example to prove this paradigm shift. With its natural and cultural diversity, heritage in this region has never been cut from its living roots and endured the modernization process so as to sustain a genuine living urban landscape. This chapter would hence explore the sustainability approach of the Recommendation on the Historic Urban Landscape through planning and management mechanisms. The city of Rabat in Morocco is taken as a case study. Being partially listed as UNESCO World Heritage by 2012, Rabat could not exist without its social, cultural and environmental landscapes. 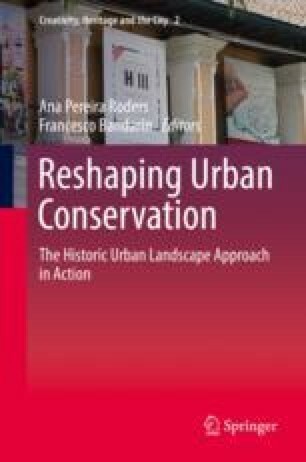 This chapter demonstrates how an urban landscape could be sustained through the preservation, planning and development tools, as well as implementation mechanisms. This chapter provides key lessons and situates Rabat as a guiding best practice that pursues the long overdue preservation and development of a heritage landscape. Agence Urbaine de Rabat-Salé. (2013, December). Plan d’Aménagement et de Sauvegarde de la Médina de Rabat. Retrieved from https://aurs.org.ma/Dossiers/20160801110837.pdf. Morocco’s Ministry of Culture Wilaya de la Région Rabat-Salé-Zemmour-Zaër. (2011, January). Rabat, Capitale moderne et ville historique: Un patrimoine en partage. Retrieved from http://whc.unesco.org/uploads/nominations/1401.pdf. Oualalou, F. (2014). Rabat, ville lumière et capitale culturelle. Metropolis: La parole des maires (25). Retrieved from https://www.metropolis.org/sites/default/files/media_root/voice_of_the_mayors/25_la_voz_de_los_alcaldes_oualalou_rabat.pdf. Agence Urbaine de Rabat-Salé, Atelier Parisien d’Urbanisme. (2010, January). Plan d’aménagement Unifié de la Ville de Rabat: Synthèse de l’analyse diagnostique thématique sectorielle. Retrieved from https://www.aurs.org.ma/Dossiers/20160801060807.pdf.